In May 2018, youth from the city of Tripoli, members from the Local Prevention Network (LPN) in Tripoli, and mediators from the municipality came together to design and launch campaigns tackling key issues in their communities. Amongst the issues which struck a chord with the group is that of gun violence and prevalence of celebratory gunfire. In the months that followed, youth worked with the prevention network to develop and launch their campaign Farha Taysheh, or ‘Stray Bullets’. 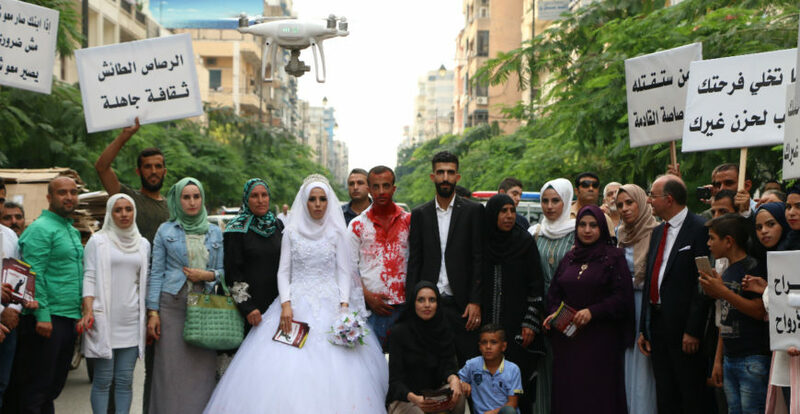 On the 18th of September a wedding celebration was arranged in downtown Tripoli, where actors would react to the feigned death of a wedding guest following a stray bullet shot by another guest. The performance was filmed and shared on Facebook, sparking dialogue and gaining media coverage. In addition to placing the issue on the agenda of local government, the campaign caught the attention of campaigners around Lebanon including Fadi Allam the founder of the Permanent Peace Movement and a key figure in conflict resolution circles in Lebanon. The next stage of the campaign will involve a series of interviews with individuals affected by stray bullets in Lebanon.